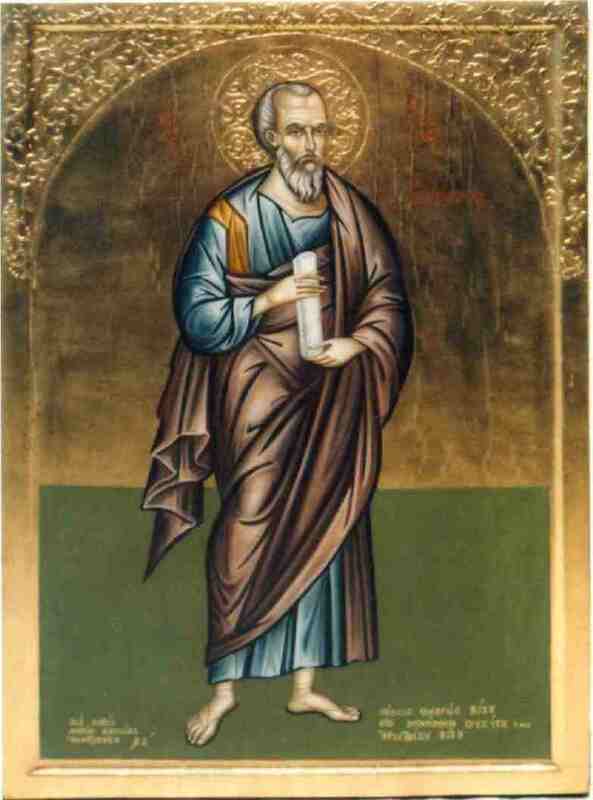 On September 13th the Orthodox Church honors and celebrates Saint Aristides, the illustrious and blessed philosopher of Athens and all-praised martyr of Christ, who has remained known in Ecclesiastical History and Patrology for his famous apology on behalf of persecuted Christians. This celebrated Christian philosopher, fiery apologist and glorious martyr of the second century was born in Athens and studied classical philosophy in the famous Philosophical School of Athens. He embraced the reverence and faith of the one true God from the enlightened hierarchs of the Apostolic Church of Athens, Saint Hierotheos and Saint Dionysius the Areopagite, whose disciple he was. He became a staunch defender of Christianity and Christians, having struggled with his famous apologetic work in a particularly difficult and critical time for the state of the Church. At the same time he managed to establish the correctness and superiority of the Christian faith, the truths of the Gospel of Christ, the excellent character of the Christians and the unjust and cruel attitude of the Roman Empire against the Christians. His unwavering faith in Christ and his struggle for persecuted Christians and the truths of Christianity created intense discomfort and resentment to the Roman Emperor Hadrian (117-138 A.D.), who decided on his exile. He went to Rome to defend himself, but then was moved to Athens, where he continued to preach Christ in spite of the many tortures incurred. 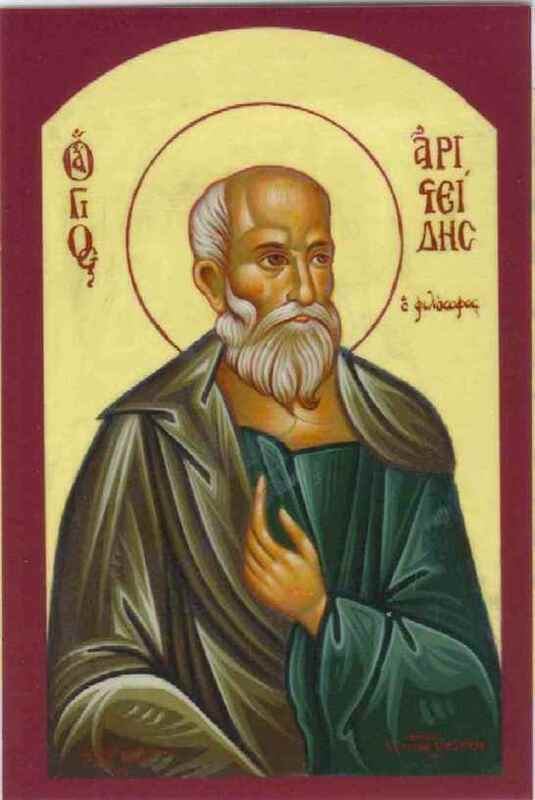 At the end of his earthly life he was brought to the market in Athens, where he suffered the agonizing death of hanging on September 13, 120 or 134 AD, the day on which the Orthodox Church commemorates and celebrates his all-honored memory. His fiery faith and fighting spirit are hymned and honored within his Service of Praise, which was written in 1990 by the Great Hymnographer of the Alexandrian Church, Dr. Haralambis M. Bousias. This same gifted hymnographer wrote in 2006 the Supplication Service and in 2009 the Akathist Oikos' in honor of the Saint. 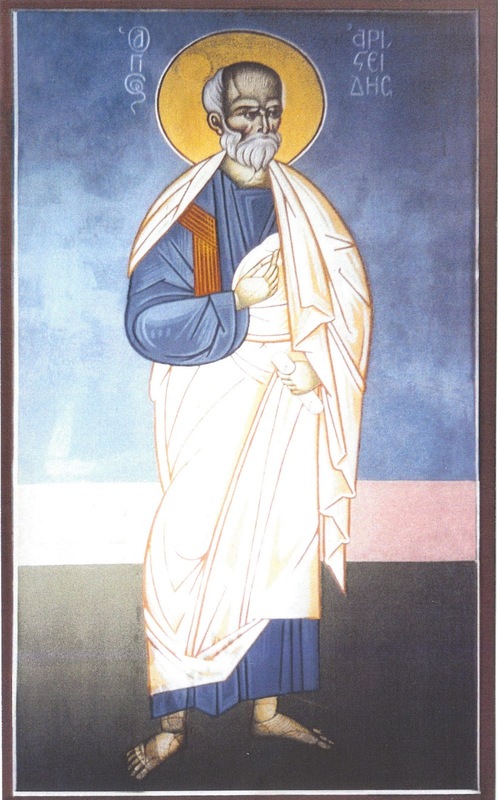 Many iconographers, beginning with the foremost Photios Kontoglou (1895-1965), have depicted the form of the Saint in churches and monasteries of our nation. Elaborate is the hand-made portable icon of Saint Aristides made by Panagiotis Markopoulos, which is kept in the historic and beauteous Church of the Dormition Chrysospilaiotissis on Aiolou Road in Athens, where every year is solemnly honored the memory of the glorious Athenian philosopher, apologist and martyr of our faith. The spread of the name of St. Aristides across the Greek territory has contributed to the spread of his honor and the construction of churches in his name in the various regions of our country. 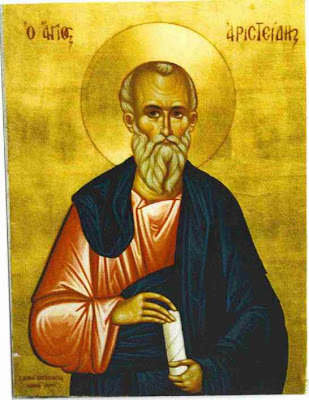 The honor of the glorious Athenian Saint began in Crete in 1986, where the Saint is honored with three churches (in Zerviana of Kissamos, Anogia of Rethymnos, and Stylos Apokoronou). In recent years the honor of the Saint spread to the region of Roumeli, where churches dedicated to St. Aristides exist in the city of Karpenisi in Arkitsa Fthiotidos. With great splendor and particular honor is St. Aristides celebrated in the Cyclades, namely Santorini and Tinos, where churches have been erected in his name. The beauteous holy Church of St. Aristides in Santorini is in the region of Exo Katoikies within walking distance from the center of Fira. It was founded on June 19, 1997 and was built at the expense of the pious family of Chris and Stavroula Makrogianneli. The Church of St. Aristides in Santorini is an architectural jewel on the island and is perfectly adapted to the Cycladic tradition. The architectural work was done by the engineer G. Kapsimalis, while the decorating with black volcanic stone was by Kosmas Syrigos. The inauguration of this beauteous temple, which was frescoed by the prominent iconographer George Livanio, was celebrated with solemnity on September 11, 1999 by the Metropolitan of Nea Ionia and Philadelphia, Constantine. The Church of St. Aristides is the center of brilliant festivities in Santorini during the two-day 12-13 September feast, which has become an institution in the island's cultural heritage, attracting many Christians from Athens and throughout Greece. The holy Church of Saint Aristides on the Holy Island of Tinos is located in Tsiknia and three kilometers from the village Steni. 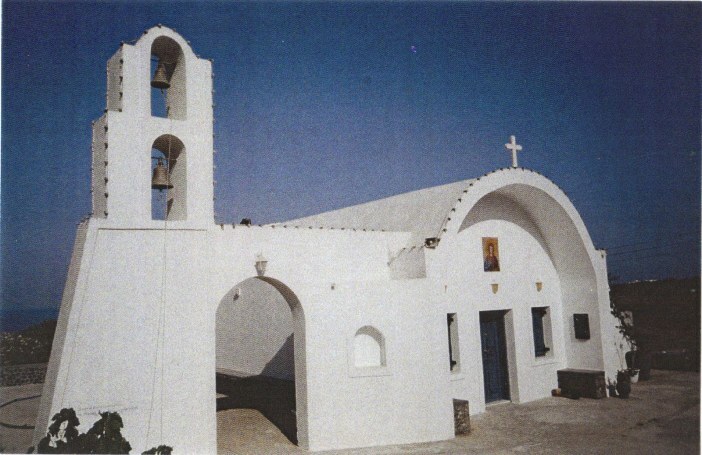 The church was erected in 2007 by the family of Mr. Anthony Vidos in memory of his father Aristides, and is built with great care and according to the ecclesiastical architecture of Tinos. It offers wonderful views of the beach Lychnaftia and cosmopolitan island of Mykonos. The consecration of the holy church occurred on September 12, 2007, the eve of the feast of St. Aristides, with the blessing of His Eminence the Metropolitan of Syros, Dorotheos II, in the presence of the Reverend Archimandrite Iakovos Setta and the Reverend Protopresbyter Fr. George Fanerou of the archdiocese of Tinos. 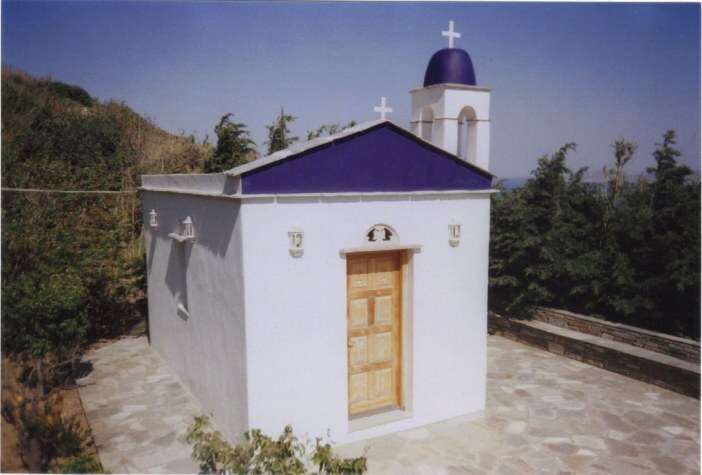 The Church of St. Aristides on the Holy Island of Tinos, which is a real jewel in the beauty of the surrounding landscape, keeps the elaborate modern portable icon of the Saint, which was created by the excellent iconographer Maria Nasioka-Apostolakis. The Church of St. Aristides in Tinos awaits the saint-loving believers and nature-lovers every year on 12-13 September to commemorate the glorious Athenian Saint, but also to taste of the generous hospitality and love of the owners.